One of the hazards too often overlooked is associated with stored or potential hazardous energy. Unfortunately, many workers get confused about lockout/tagout because they think it only applies to electrical work - and that can be a grave mistake. All workers could be exposed to the dangers of hazardous energy. Workers need to be familiar with when lockout/tagout is needed and what to do if they find it in use in the workplace. Lockout tagout is a set of procedures that ensures hazardous energy sources are shut off during service and are unable to be reactivated (or turned on) until the work is completed. Lockout refers to the act of placing a physical barrier, such as a lock, cover or chain, that prevents a machine or equipment component from being turned on or activated. Tagout is the application of a label or tag placed near the lockout that alerts others to the lockout status of the equipment. Lockout and Tagout should always be used together to maximize safety. OSHA General Industry Standard 1910.147(a)(1)(i)[Logout/Tagout] This standard covers the servicing and maintenance of machines and equipment in which the unexpected energization or start up of the machines or equipment, or release of stored energy, could harm employees. This standard establishes minimum performance requirements for the control of such hazardous energy. Lockout/tagout is required to protect workers from unexpected startup or unexpected release of hazardous energy. Failure to properly lockout and tagout equipment can result in injuries to the workers who are servicing, repairing or adjusting the equipment. Lockout tagout procedures can also be used to prevent unauthorized use of heavy equipment on a construction site. OSHA General Industry Standard 1910.147(a)(2)(i) This [lockout/tagout] standard applies to the control of energy during servicing and/or maintenance of machines and equipment. 1910.147(b) Servicing and/or maintenance. Workplace activities such as constructing, installing, setting up, adjusting, inspecting, modifying, and maintaining and/or servicing machines or equipment. These activities include lubrication, cleaning or unjamming of machines or equipment and making adjustments or tool changes, where the employee may be exposed to the unexpected energization or startup of the equipment or release of hazardous energy. OSHA Construction Standard 1926.702(j) No employee shall be permitted to perform maintenance or repair activity on equipment (such as compressors mixers, screens or pumps used for concrete and masonry construction activities) where the inadvertent operation of the equipment could occur and cause injury, unless all potentially hazardous energy sources have been locked out and tagged. Tags shall read Do Not Start or similar language to indicate that the equipment is not to be operated. Chemical - chemicals that may be stored in pipes, tanks, and/or held under pressure. Pneumatic - trash compactors, compressors, lifting equipment. Thermal - extreme heat from heating elements or furnaces or cold energy from refrigeration units or compressed gases. Electric - electrical equipment which is either wired or operated by cord and plug. Mechanical - stored energy in rotating or moving parts or conveyor belts. Other - such as x-ray, radiation, laser, microwave, radio frequency, or others. 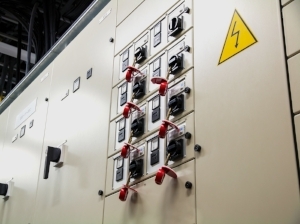 Lockout devices are designed to keep the equipment from being turned on or to keep the energy source from being released. OSHA Construction Standard 1926.417 Controls that are to be deactivated during the course of work on energized or deenergized equipment or circuits shall be tagged. Equipment or circuits that are deenergized shall be rendered inoperative and shall have tags attached at all points where such equipment or circuits can be energized. Tags shall be placed to identify plainly the equipment or circuits being worked on. Tagout devices are designed to notify other personnel that the machine, tool, or equipment is being worked on and is unsafe to tamper with in any way. All employees must know how to recognize when equipment is locked out, tagged out or both. They should be trained to look for tags, signs or locks at startup points, switches, valves and control panels. Lockout/Tagout devices should NEVER be tampered with and no one should ever attempt to bypass a lockout or tagout device. Only personnel that have received specific training and follow the correct procedures are authorized to perform lockout/tagout. Weeklysafety.com gives you instant access to hundreds of safety meeting topics and toolbox talks, including a full safety meeting kit that covers Lockout/Tagout Awareness. Stop searching for new safety meeting ideas every week. For a super-low subscription price, you can have access to hundreds of safety topics and get over $1800 in free gifts including a customizable safety manual, new hire orientation, a free book and so much more. Click the button below to learn how you can sign up for a risk-free subscription today.